John Boyega's Finn has certainly come a long way from when we first met him in Star Wars: The Force Awakens, especially since he didn't even have a name of his own, going by his Stormtrooper number FN-2187. After leaving the First Order behind in Star Wars: The Force Awakens, John Boyega reveals in a new interview that, in Star Wars: The Last Jedi, he's even ready to leave the Resistance behind as well. Here's what John Boyega had to say about where Finn's head is at, after watching Han Solo (Harrison Ford) die, while also helping destroy the Starkiller Base. "It got really real for him. And he just wants to get away and not be involved. His intention in the first place was to go to the Outer Rim. He was always brought back (in The Force Awakens), but this is his chance to get away and perhaps find Rey and go off together. He's trying to do that at first. Everyone in the space, throughout the galaxy, would have heard about the young Jedi who discovered her powers and defeated Kylo Ren and the young former Stormtrooper who helped save the day. He's a hero to people like Rose, who fight for the Resistance because their homes have been destroyed by the First Order." 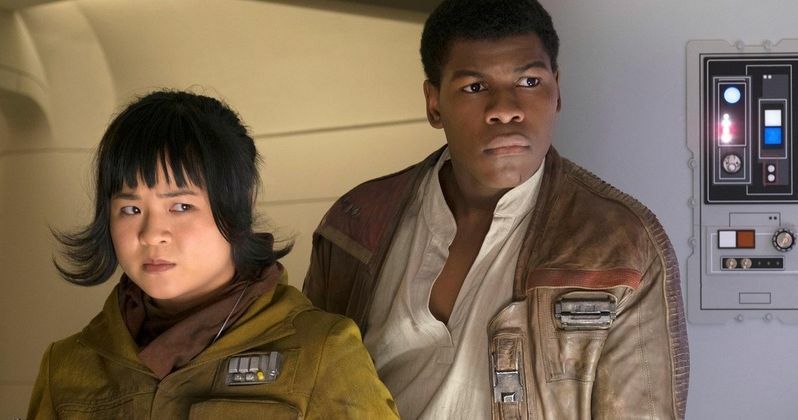 Fans got their first look at Kelly Marie Tran's character Rose Tico during Star Wars Celebration, a Resistance mechanic who is teamed up with Finn on a secret mission to the casino planet known as Canto Bight. The actress revealed that Finn is viewed as a 'big deal' when she first meets him. She's described as a "gearhead, grease monkey, behind-the-scenes jack-of-all-trades," while her sister Paige (Veronica Ngo) is a Resistance gunner. Here's what Kelly Marie Tran had to say about how Rose fits in within the Resistance in her interview with Entertainment Weekly. "Poe Dameron is super cool. Finn's super cool. Even though [Rose] is good at what she does, she's not known. She's not cool. She's this nobody, this background player, which is what makes her interesting. She's not the best. She's not royalty. She's someone who is just like everyone else." Since Finn was taken from his family at a very young age to become a Stormtrooper by the First Order, it's reasonable that he doesn't take to the spotlight too well. John Boyega reveals that he likes all of the praise for his work at first, but it doesn't last long. Here's what he has to say below. "He appreciates the adoration for a second, but when he meets her, Finn is trying to escape the whole war. He's trying to leave. And she comes in and basically gives him a depiction of himself that wasn't necessarily true. It's now an opportunity for him to be the best he can be. He has to make a decision, and Rose is there to help him make that choice." This report also reveals that Rose helps keep Finn "in the fight," although there is still part of him that wants to strike off on his own. Writer-director Rian Johnson also acknowledges that, like The Force Awakens mirrors A New Hope in some places, Star Wars: The Last Jedi is quite similar to The Empire Strikes Back, although the director stated that wasn't intentional. Here's what he had to say below. "I just tried to kind of ignore that aspect of it and have the story take the shape that it needed to. But look, Rey is off in a remote location with a Jedi master, and the Resistance is in a tough spot, and we're intercutting those stories. By its very nature, there are some structural parallels. But these are new characters, they're dealing with new things, and that ultimately is what defines the movie. So I think that's going to be unique." One of these similarities is the metropolis Canto Bight, which is on the world of Cantonica, which has some similarities to Cloud City in The Empire Strikes Back. The director revealed that the whole city is like a "luxury resort that's been built on this very otherwise abandoned, arid planet," adding that, "It's like Vegas with aliens. So maybe it is just like Vegas." Take a look at the new photo of John Boyega and Kelly Marie Tran from Star Wars: The Last Jedi below.